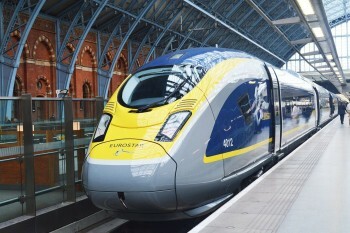 Is Eurostar Frequent Traveller ‘part pay with points’ a decent deal? Over the weekend we are looking at whether it is worth using your Virgin Flying Club miles as part payment for a booking. (Short answer: it isn’t). We’ve also looked at ‘part pay with Avios‘ quite a bit recently for British Airways tickets. I thought it was worth a look at using ‘part points, points cash’ for Eurostar tickets. As a member of Eurostar Frequent Traveller (not to be confused with Eurostar Plus Points, their leisure-based loyalty scheme) you can use your rewards on Standard Class, Standard Premier and Business Premier tickets. There is also a ‘part points, part cash’ redemption option available. The key point to remember is that you can only use ‘part cash’ when booking REWARD tickets. You cannot mix Eurostar Frequent Traveller points and cash to buy a revenue ticket. One-way journeys cost half the amount of points and cash. Note that ‘cash and points’ tickets can only be booked by telephone. It is certainly a good deal if you don’t have enough points to get the tickets you need! This scheme allows you to book a redemption for fewer Eurostar Frequent Traveller points than you would otherwise need, so on that basis it is a good deal irrespective of how the maths stacks up. If you need two tickets, you may need to do the maths based on the cash price. Imagine you have 1,000 points. You can either redeem 900 points for one free Standard ticket and pay cash for another, or use 500 points + £60 for two redemption tickets. If a Standard Class ticket would cost more than £120, ‘part pay with points’ is a better deal. You also get to retain flexibility – if you had one redemption ticket and one cash ticket, you would lose flexibility because the cash ticket would be non-changeable. However, there is one scenario where I do not think that ‘part pay with points’ is a good deal. Eurostar Frequent Traveller is an American Express Membership Rewards partner. The transfer rate is 15:1. As you can see above, Eurostar is effectively charging you £15 for every 100 points you need. However, if you have some Amex points, you can get those same 100 Eurostar points by converting 1,500 American Express points. Using 1,500 Amex points to save £15 values them at 1p each. That is a VERY GOOD return on Amex points, which are only worth 0.5p if redeemed for gift cards and rarely more than 1p when redeemed for airline miles or hotel points. Before using ‘part pay with points’, consider transferring over Amex Membership Rewards points instead if you can. It is a better deal. For Carte Blanche holders, the additional benefit of redeeming vs buying cash is that the redemption ticket is, in fact, fully flexible whatever the class of travel. This is an invaluable benefit. I was travelling on a redemption standard ticket last month and could change it to an earlier train at the station as I would have done with a business premier ticket. Redemption tickets can be changed (once only I think) and Carte Blanche holders can redeem as long as there is still a seat available in the train. Do you know how flexible or otherwise they are if you a Carte Blanche holder? Points just have to be redeemed from a Carte Blanche account. My wife has Carte Blanche, I don’t. I was travelling alone but redeemed from her account and as such got the flexibility. Another time I was travelling with my wife on cash tickets. They did not want us to change for an earlier train without a fee + fare difference. Flexibility is only guaranteed on redemption tickets when redeemed from a Carte Blanche account. PS also: what is the redemption availability like on Eurostar? If availability is good, it seems like these would be valuable redemptions if you wanted to book weekends away a week or two out, when the standard return price is often £200-300. This depends on whether Carte Blanche redemption or not. If Carte Blanche, you can redeemed on any train, as long as their is one ‘cash’ seat available. I often redeem for travel on the same day. For non-Carte Blanche holders, redemption tickets are available as long as the cash fare is no more 99.50 pounds single (based on a quote for a return ticket). Friday evening tickets are hard to be booked less than 10 days in advance. There is a bit more availability usually on Sunday evenings. Great, thanks. Sadly I’ll never be Carte Blanche, but this still looks decent for booking a few weeks out (which cash fares rarely are). Except you can do much better than 1p for AMEX from e.g. Avios and even you get 1.2p per Avios you mentioned Rob. However, this would give you £15 cash in hand I suppose…. True, in extreme scenarios you can do better. But this is, as you say, a genuine ‘in your hand’ 1p per point cash saving – rather than playing around trying to justify the value of some Avios for a flight redemption.